The General Representative Mestre is the maximum authority of the Beneficent Spiritist Center União do Vegetal. The name of the position is because it represents the UDV’s creator, Mestre Gabriel. With the help of six Assistant Mestres, the General Representative Mestre leads the Spiritist Center from the religious perspective and supervises the whole institutional administration of the religion. He is elected by a specific electoral college for a three-year term. The current General Representative Mestre is Paulo Afonso Amato Condé. His term started on January 6, 2018, and will conclude on January 6, 2021. 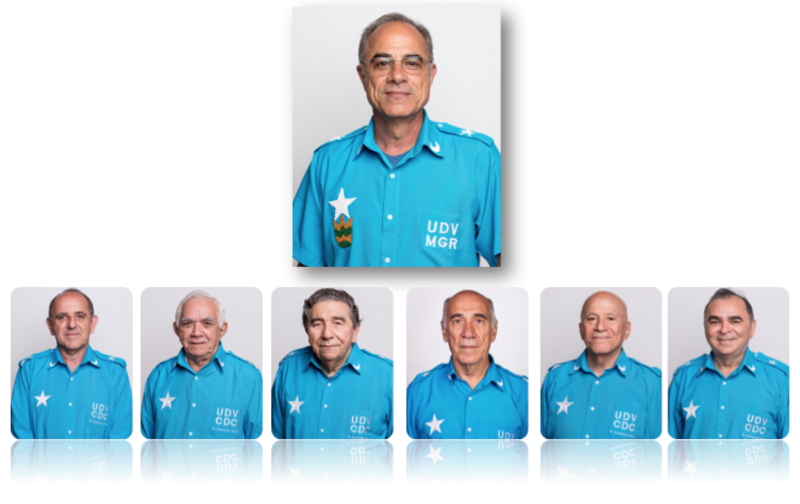 The General Representative Mestre and hisa Assistants (Teodoro Irigaray, José Luiz de Oliveira, Roberto Evangelista, José Carlos Garcia, José Anchieta Torreão de Sá and Mário Rodrigues Filho) constitute the General Representation of the UDV. These are all volunteer positions. The Council of General Administration (Conselho de Administração Geral, CONAGE) has, among other competencies, the responsibility to care for the maintenance of the order and harmony of the members of the UDV and to establish procedures for the formation and the improvement of the leaders of the institution. The Council is composed of the members of the General Representation, of the members of the Council of Recordation of the Teachings of Mestre Gabriel, of the Central Mestres of the regions, of the mestres who occupied the position of General Representative Mestre, of the Representative Mestre of the General Representative Mestre, of the President of the General Directorate, and of the mestres that the Council institute as members (three mestres indicated by the Council itself, as well as two mestres indicated by the General Representative Mestre), per three-year period. According to the laws of the UDV, the founding mestres of the Spiritist Center, members of the Council of Recordation of the Teachings of Mestre Gabriel, and the mestres who have held the position of General Representative Mestre are permanent members of the Council of General Administration. With the objective to care for the discipline and to supervise the works in Núcleos and Authorized Distributions of Vegetal in each region, the Central Mestre is elected by the Cadre of Mestres of the respective region, after the indication of three names by the General Representative Mestre. The Central Mestre is one of the auxiliaries of the General Representative Mestre in conducting the works of the União do Vegetal, and is also a member of the Council of General Administration. The UDV is currently organized in 19 regions, 17 of them being in Brazil, one in the in North America and another one in Europe.